cubatravel has been a member since February 27th 2014, and has created 16 posts from scratch. Villa Clara province covers 8,413.13 km2 (3,248.33 sq mi) and an immense stretch of Cuba’s popular northern coast incorporating the exotic Jardines del Rey islands of Cayo Las Brujas, Cayo Ensenachos and Cayo Santa Maria. Villa Clara is located in the central region of the island bordering with the Atlantic Ocean at north, Matanzas Province to the west, Sancti Spiritus Province to the east, and Cienfuegos Province on the South. With a population of approximately 860,000 the province is one of Cuba’s largest income per capita regions and an important center for both coastal and ecological tourism. Villa Clara shares with Cienfuegos and Sancti Spiritus on the south the Escambray Mountain Range. Its main cities are the capital city of Santa Clara, Remedios, Sagua La Grande, Camajuani, Caibarien, Ranchuelo, Placetas, and Manicaragua. Not to be missed is the city of Remedios, historic center of Cuban history and the base of Cuba’s most popular festival held in December each year. Aside from the beach resorts Villa Clara also has a strong ecotourism infrastructure. The people of Villa Clara have been some of Cuba’s fastest adopters in the nascent self employment sector, with Remedios being an often cited national model, featuring excellent well run Casa Particular Bed & Breakfast properties, along with private paladar restaurants on almost every corner serving good quality meals at a fraction of the cost of government restaurants. Tags: Attractions Villa Clara Cuba, Bed & Breakfast Remedios Cuba, Casa Particular Remedios Cuba, Cayo Ensenachos Villa Clara, Cayo Las Brujas Villa Clara, Cayo Santa Maria Villa Clara, Facts about Villa Clara Cuba, Population Villa Clara Cuba, Tourism Villa Clara Cuba, Villa Clara Jardines del Rey, Villa Clara Northern Islands, Visit Villa Clara Cuba, Where is Villa Clara Cuba? Hotel Barcelona Remedios is part of the new Hotels “E” group of hotels belonging to Grupo Cubanacan. The E stands for Enchanting. Located in the attractive town of Remedios known as the “eighth village of Cuba” based in the Villa Clara province, Hotel Barcelona has 34 rooms and is located near the Hotel E Mascotte, which was also revamped and reopened in 2012. Both E chain hotels are located in the historic center of the town of Remedios, which will be a resort for tourism, one of the Cuban cities where there is a preserved colonial architecture, and famous for its partying, similarly and as is characteristic of hotels operating under this brand, personalized service and elegance, the Hotel Barcelona distinguished. Founded in the 16th century, San Juan de los Remedios is one of the oldest towns in Cuba – a palpable history best appreciated while strolling the cobblestone streets of this enchanting colonial town. 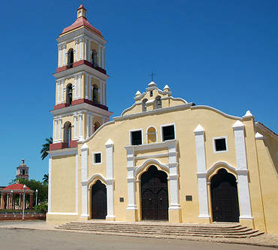 Remedios is famous for its festival every December 24th known as Las Parrandas. It’s appropriate that such a quaint, historic town should boast two boutique hotels. Together, the beautifully restored Hotel Mascotte (from the 1860s) and Hotel Barcelona Remedios (1926) are the pride of this tranquil town and prime examples of architectural renovation. In fact, they both share the “E” distinction, standing for Hotel Encanto, a merit awarded to those hotels in cities or colonial towns preserving architectural and historical values, while promoting national patrimony and personalized services to travelers. The Barcelona has 24 rooms surrounding a cozy and inviting interior patio serving as a central hangout for guests. The reception area, lobby, bar and restaurant are stylish and inviting. The Barcelona also has a rooftop sun terrace which is a big hit with guests. Our booking process is unique because it shows the best rate from all of these for Barcelona hotel in Remedios Cuba and the types of rooms available. Our Barcelona Remedios Cuba rate comparison is an industry first for Cuban Hotels. Once you’ve compared the rates, finalizing the booking at Barcelona Hotel takes just seconds and an immediate confirmation is provided in real-time. The Santa Clara Libre is a modern and comfortable hotel directly on Parque Vidal built in 1950s modernist style 10-stories; mint-green high-rise is perfectly located at the main city center square, Parque Vidal and flanked by La Caridad Theater, the Museum of Decorative Arts and the José Marti library all right in the center of Santa Clara. The restaurant, located on the top floor, offers delicious Cuban dishes and a beautiful view of the city.